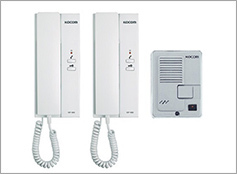 This home intercom system package consist of 1 unit DR2K (as door unit) and 2 unit DP201R (as room unit). Door unit is typically installed near the door. Room unit consisting of a master and sub station is typically installed inside a secured room.